It’s called “waste” water for one big obvious reason, but researchers in Austria decided not to let the water go to waste, so they trudged through the sludge in hope of finding a new bacteria that might turn ammonia into nitrate. Instead, they found a giant Frankenstein virus that may turn the study of viruses upside down. 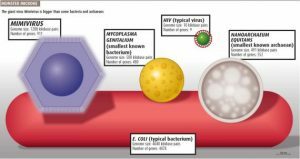 In case you’re looking for places to avoid on your next vacation in Austria, the giant viruses were taken from the a waste-water treatment tank in Klosterneuburg, Austria. 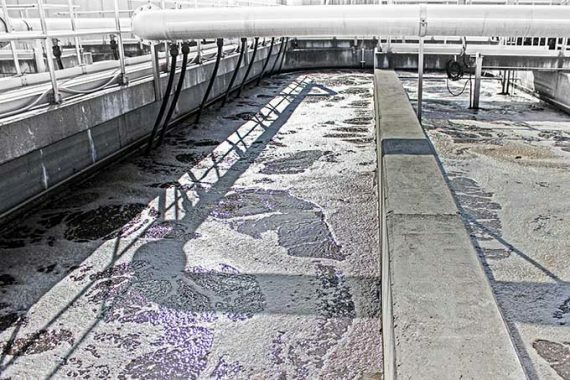 They were then sent to the US Department of Energy Joint Genome Institute in Walnut Creek, California, to a lab where JGI postdoctoral researcher Frederik Schulz, DOE JGI Microbial Genomics Program lead and study co-author Tanja Woyke and National Institutes of Health evolutionary and computational biologist Eugene Koonin took a look at the wastewater. Well, not just any look. 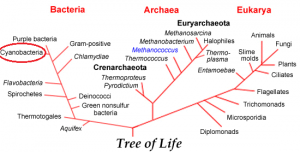 Schulz and his colleagues analyzed metagenomic data (all of the genetic material in the sample) and found a previously unknown giant virus. 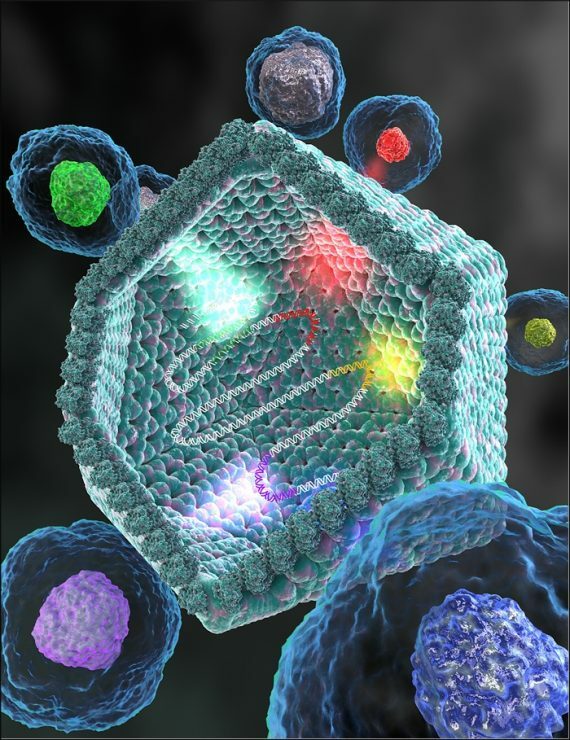 Giant viruses were discovered in 2003 and given the name Mimiviruses (apologies to anyone named Mimi) and immediate split the virus research world into two feuding camps – one that believed they evolved from organisms that discarded unneeded genetic material as they became parasites, and another that believed viruses were particles that were created by stealing bits of genetic material from other organisms. (If you think this sounds like the experiments of a certain horror story doctor, you’re getting ahead of me). Schulz and his team determined that their new giant virus – now called the klosneuvirus after the waste treatment plant that spawned it – had about 700 genes in common with cellular organisms, many more than other viruses, thus making it a giant among giants. This led the team to speculate that the klosneuvirus evolved from a singular cellular organism rather that from another virus. However, further analysis showed that the genetic material came from a variety of organisms — flash the “Frankenstein!” light here and publish the study. That pushes the klosneuvirus into an entirely different feud … is it a new fourth domain in the Tree of Life – joining archaea, bacteria, and eukarya? 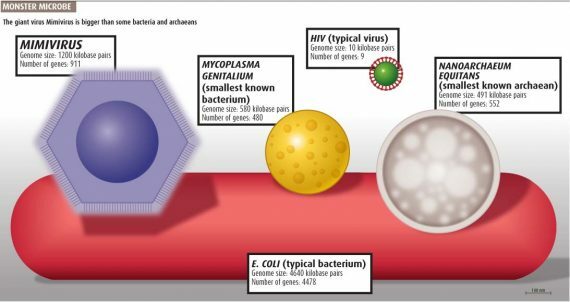 While some scientists say giant viruses are by definition a new domain, Schulz’s team says their research shows that klosneuvirus descended from a smaller virus that continued to acquire bits of genetic material over a long evolution to become the big, efficient viral machine it is today. And it’s expected to get bigger, according to Eugene Kookin. I’m quite confident that the current record of the genome size of giant viruses will be broken. We are going to see the real Goliaths of the giant virus world. Dr. Frankenstein would be so proud. Dental fillings with mercury can cause over 30 chronic health conditions!